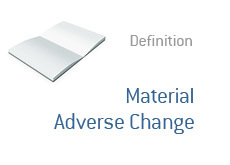 Material Adverse Change - What Does It Mean? What is a "material adverse change" clause, or MAC clause? What would a merger agreement include a MAC clause? A "material adverse change" clause gives an acquiring company the opportunity to back out of a merger is there is a "material" change in the company that is being acquired. During the heart of the economic meltdown in 2008, Bank of America threatened to back out of their deal with Merrill Lynch due to a "material adverse change" in the well-being of Merrill Lynch, but Henry Paulson and Ben Bernanke allegedly threatened Ken Lewis with the loss of his job (and the rest of the BAC management team) if they walked away from the deal. Bank of America was threatening to invoke the MAC clause due to the ballooning losses at Merrill Lynch. This deal eventually went through. Let's say that you run XYZ, and you are going to be acquiring ABC. Let's say that ABC has had 19 quarters of very steady profits, and they are expecting this streak to continue. Let's say that you have agreed to acquire ABC, and that you have included a MAC clause. Let's say that before the deal closes, ABC reveals that the CFO was inflating revenues using some accounting trickery and that ABC will need to restate their earnings from the last six quarters. This is a Material Adverse Change, and XYZ would be fully within their rights to walk away from the deal at this point. Again, the point of the MAC (Material Adverse Change) clause is to protect the acquiring company from some material change in the circumstances of the company that is being acquired. After all, it wouldn't be fair for XYZ to acquire ABC, and then for ABC to tell XYZ "Oh, by the way, we've been lying about our quarterly numbers for the past two years, but you still have to acquire us now anyways."